….and London on the 8th! Here are the edited highlights of the week, feel free to comment below if you have any questions or would like copies of the photographs (all taken by Heather Armstead). I wasn’t at the Bushcraft Show last year so I was very much looking forward to being back for 2013. Organised by Woodland Ways, the venue varies every year and this time we were at Elvaston Castle, in Derbyshire. We arrived on the Saturday afternoon and had plenty of time to wander around and catch up with some old friends, as well as gaze wistfully at all the shiny bushcraft and survival goods on sale. Strangely, for a bank holiday in Britain, there wasn’t a cloud in the sky – glorious sunshine prevailed throughout. Of course, we’d packed waterproofs and jumpers, so both I and my apprentice made emergency hat purchases! Working on my tan wasn’t something I’d expected to be doing at the show, but I was glad to soak up the sun. 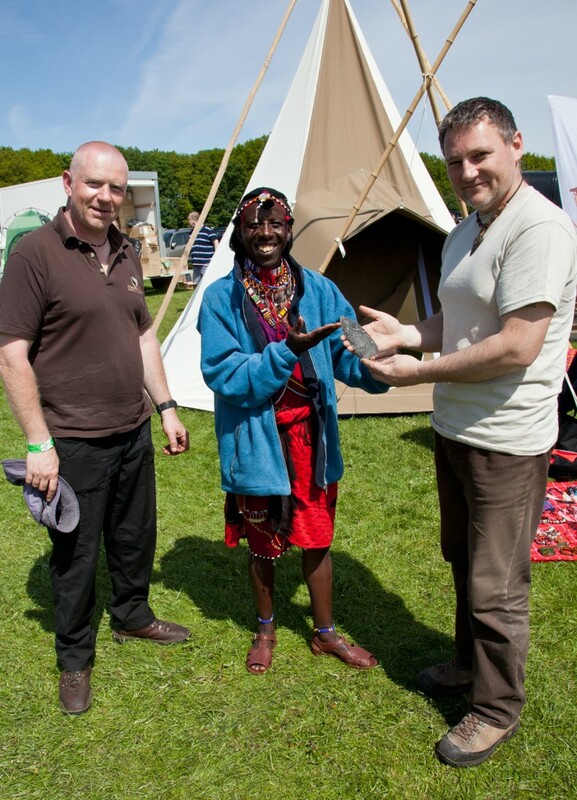 However, the 2013 show eclipsed all others for me, as Jason Ingamells, director of Woodland Ways, had organised for a Maasai dance troupe to attend, putting on traditional dance displays, weapons displays and to raise money for their village by selling incredibly intricate beadwork necklaces. I really can’t put into words how amazing the Oloip Maasai were – completely fearless, friendly and totally unfazed by modern British life. They are a proud and dignified people, but warm and welcoming at the same time. 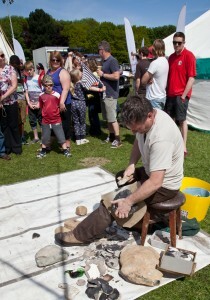 While demonstrating for the crowds, I was working a lovely piece of chert that became a Bronze Age Beaker dagger blade. As I knapped, I watched the Maasai dancing, and decided to make an impromptu gift of the blade to them; after they had finished their routine, Kev from Woodland Ways introduced me, and explained that I wanted them to have the dagger. They were absolutely thrilled, and promised to save the blade to use in a ceremony back at home. More pictures, including what happened when the Maasai had their first introduction to motorbikes (yes, really) are on my Facebook site. Presenting the dagger blade to the Maasai. Packing up on the Monday afternoon, it was into the Primtechmobile and back home to Gloucestershire for a well earned soak in the bath and a good night’s kip. Then at daft o’clock in the morning on Tuesday, it was back on the road, heading to Brixham near Torbay. Unfortunately, we seemed to have left the good weather back in the Midlands, and our day at the Heritage Museum was punctuated by run-for-your-life rainstorms, much to the dismay of my apprentice, who’d been sent to fetch some pasties for lunch, right in the middle of a torrential downpour. Having an apprentice has a lot of benefits! 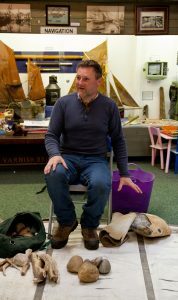 Brixham is a small museum in terms of floor size but they manage to fit a lot of good displays in; particularly the Maritime Heritage room, where I was holding workshops. While out of my element on water (unless it’s from inside a fishing boat!) there is a lot of history attached to the town and its shipping fleet, and the museum is well worth a visit. After finishing up two workshops, it was back in the car for the drive across to Pembrokeshire, for more workshop sessions on top of the Iron Age hill fort site at Castell Henllys. I’ve been to the Castell several times but I think this was the first trip where it wasn’t raining or blowing a gale! The ‘Prehistoric Extravaganza’ is always a great day out for families, and it wasn’t long after setting up that the crowds started the walk up to the summit. 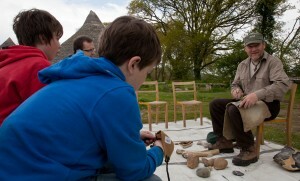 There were lots of other craftsmen and women to chat to and exchange knowledge with; fire lighting, baking, wood-turning, smithing and story telling just to name the trades I could see from my spot. I had a lovely couple of groups to teach, and then – stop me if you’ve heard this before – it was back to the car for another road trip. York was the next stop, for three days at the Yorkshire Museum. 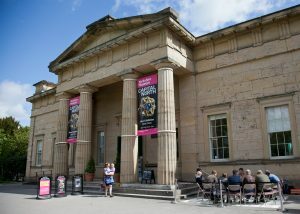 This was my first visit to the Yorkshire Museum, and as a Yorkshire lad myself, I have to say it was good to be home! 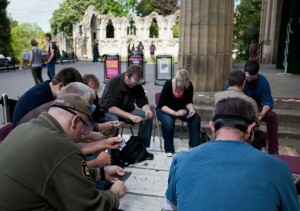 The sunshine followed us from Wales, so rather than set up inside, we decamped to the small plaza outside the museum. What a great place to work! The gardens were heaving with people out enjoying the weather, so there were plenty of interested folks stopping to watch and to handle the travelling collection. Often on my travels, I find that museums I work for have either a small prehistoric collection, or sometimes none at all! It was a pleasure, therefore, to see the wonderful gallery of prehistoric artefacts that the Yorkshire Museum had laid out. There was a brilliant timeline in the gallery, with British stone tools from the earliest found right through to the Bronze Age finds, and there were cabinets with the amazing antler frontlets from the Starr Carr excavations in the nearby Vale of Pickering. What a great background for a workshop session! Having wandered through the gallery for inspiration, I made a replica waisted axe, of the type typical to the area. On the third day there, I was asked by a passing member of the public to take a look at some lithics he’d found and had brought in for identification by museum staff, and I was thrilled to see a lovely (albeit broken) example of a Langdale stone axehead. York also took the prize for the ‘Most Random Intended Use of a Neolithic Arrowhead’ – a lady passing by the handling collection was particularly taken with one of the leaf-shaped points, and asked if it would be possible to dull an edge down. I often dull points down if they’re being bought for children, but it turned out that this lady was a taxidermist who was looking for a thin, sharp tool for use on small birds, but wanted a scraping edge as well as a cutting edge! Keep an eye out on my Facebook site for photos of my trip to Salisbury and the upcoming demonstration at the European Palaeolithic Conference at the British Museum this Saturday, and thank you to everyone who booked, hosted and brought me cups of tea over the last week and a half!